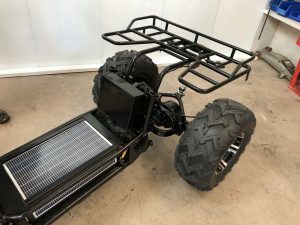 While the Boomer Beast is a unique design, opening up the capability for a mobility option for offroad areas, it does have a few design issues that impact the overall use. The biggest issue is the seat position. 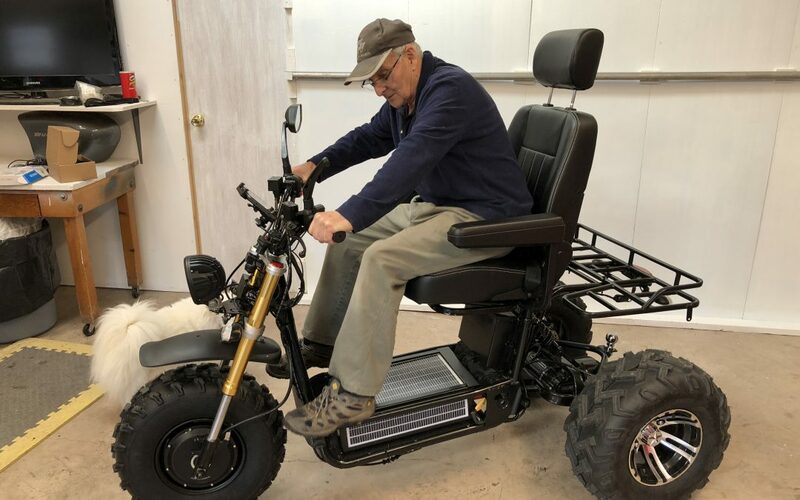 As we noted in Part 2, the Boomer Beast is basically a combination of the Beast EBike with the Ultra Beast ATV. As part of this conversion, the king seat is simply welded onto the EBike seat frame and mounted to the frame using the existing mounting posts. The issue, however, is this puts the seat much too high and rearward for even riders that are over 6 feet tall as the king seat base is higher due to the slider as well as the added thickness of the seat itself, raising it 6-7″ over the bike seat position. This results in needing to lean forward to reach the handlebars and well and leaving the legs bent downwards to reach the foot pegs. Even with the seat slide fully forward on the built-in slider mechanism, it is still a high uncomfortable position. For all intents & purposes, the stock placement of the seat is unusable in any comfortable, safe, ergonomic manner and we see it as a design flaw. This concern was raised with Daymak and the local dealer. 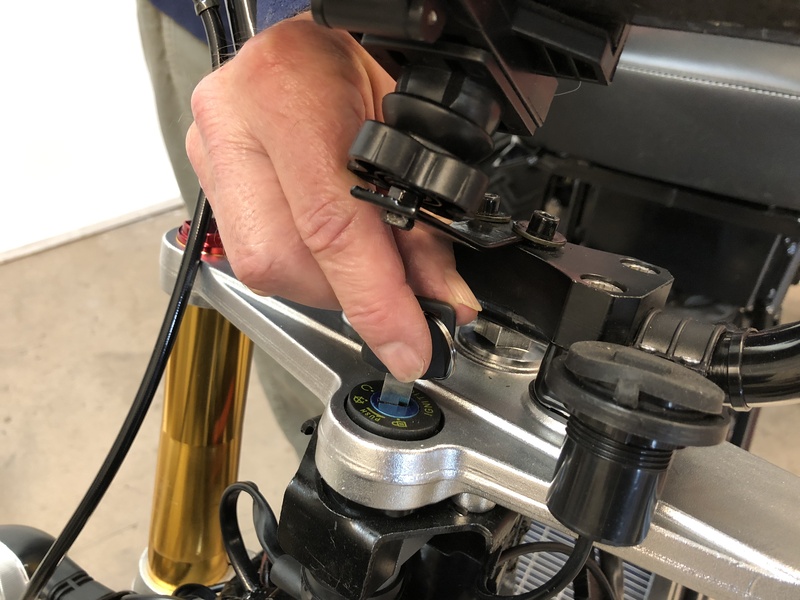 The dealer mentioned they had to modify the seat setup for another customer for the same reasons, which involved welding in new mount tubes and moving the electrical components which are located below the seat in order to lower it to an effective position. We understand the issue was passed on to Daymak by the dealer and the feedback was that it would take “years” to redesign the current setup. This is an issue we noted even prior to ordering, so we intended to correct it ourselves regardless, and within a few hours of the review came up with multiple solutions that required minor modifications. 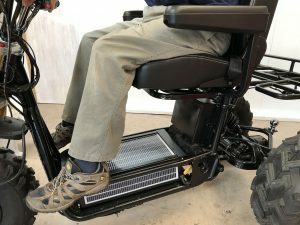 However, for the typical buyer, this may be beyond their capabilities, especially if they have more serious mobility issues. A proper factory redesign would not be a multi-year process in our view, and one that is needed. The second ergonomic issue, which is much more minor than the seat, is the placement of the tablet and mount. Its stock placement puts it directly over the key area, making it difficult for even a person with full dexterity to insert, remove, and turn the key. Turning the mount 180 degrees solved this somewhat but again it is an inherent design flaw that should be addressed by Daymak at the factory, and not left for the customer to deal with. The USB port also ends up being blocked in part by the tablet as well, although less so than the key. In the next article, we will go into more of the quality & safety issues with the stock Boomer Beast setup. The overall centre of gravity is too high on this vehicle. It is extremely unstable over small bumps and obstacles. I have tipped mine over several times when going over something that should not have been a problem. I have the ultimate version which has a motor on the front wheel in addition to the rear wheels. I find it to be underpowered for climbing hills. Their website claims it will climb a 20 degree hill. This hasn’t been my experience. We’ve since lowered the seat as that was one of the major issues with the stock setup. Surprised they could even sell and ship it as is.